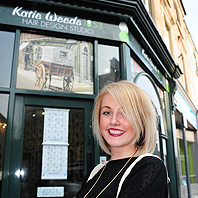 “I opened my own salon within a year of qualifying as a hairdresser at Derby College. The salon has been open for five months. It employs three people, including me, and is about to welcome a new hairdressing apprentice. “Taking an apprenticeship gave me the hands-on training I needed to be able to qualify as a hair stylist and open my own salon. The apprenticeship also enabled me to see the bigger picture. Wages are low at first and you have to be prepared to put in the hours, but the rewards are there if you work hard. Derby College was recommended to me by other people who had trained there. The salon facilities at college were also newly fitted out and were great. I did most of my training at a local salon, where I was doing my apprenticeship, but did carry out some assignments while on the course. We did a photo shoot at college and had to create 1960s avant-garde styles, which was good. The photography students took the photos as part of their course work.